Lee Ann Mauk spent nine days without power after Spokane’s 2015 windstorm. She couldn’t turn lights on, take a hot shower or keep food frozen. But through it all, her landline phone kept working. “We didn’t have stoves. We didn’t have hot water. We didn’t have refrigerators. But we did have our phone,” she said. It’s no secret that the number of households with landlines is dwindling across the United States. As of December 2015, the most recent data available from the Federal Communications Commission, Spokane County had 96,000 active residential landlines. That’s about one for every two households. That number is down from the June 2014 FCC count, which showed 106,000 residential landlines in Spokane. In Kootenai County, the number for both snapshots was 40 percent. We asked readers to weigh in about whether they had a landline and why on Facebook and got nearly 100 responses. Those who still have landlines said the ability to reach kids at home, power outages and call quality were all reasons to keep the phone around. Jenny Louie said she uses her landline to sign up for things that require a phone number, and so she doesn’t have to get her 11-year-old a cellphone. “We need a phone at home that they can use in case of emergency,” she wrote. Others pointed out schools still teach young kids to dial 911 on a landline. Some readers said they felt more secure in an emergency knowing 911 dispatch can read their location off a landline. But it’s not quite that simple, said Spokane fire communications dispatch chief Jay Atwood. Traditional landlines that rely on cables, usually provided by CenturyLink in Spokane County, transmit an address to 911 dispatch. But cellphones often do, too, and in many cases, the location is fairly accurate. “Sometimes it can be really precise and sometimes it’s a quarter-mile off,” Atwood said. Cellphone location pinpointing is a county-by-county technology. Spokane has had it for years, Atwood said, and tends to be ahead of the curve. Smaller or more rural counties may not have that ability. What can be a problem are landlines that use the internet to transmit calls. Those landlines, called voice over internet protocol, or VOIP, are usually the ones that come bundled with Comcast or other cable TV service. Atwood said VOIP landlines come up with the subscriber’s address, based on whatever information they have in their account. If someone’s recently moved and hasn’t updated that information, 911 could end up with the wrong address. Regardless of how a call comes in, 911 dispatchers always ask for a location to avoid confusion. Some people said they keep a landline around because of spotty cellphone service at home. Surprisingly, FCC data show little correlation between how rural a county is and the percentage of households with landlines. Landline coverage is highest by far in Wahkiakum County in southwestern Washington, at 82 percent. But Whitman County saw the lowest coverage in the state, at just 39 percent. Other more rural counties, including Asotin, Adams, Douglas, Kittitas and Walla Walla, are between 40 and 50 percent, while 54 percent of King County households still have a landline. Among readers who had given up a landline, telemarketers were a big reason. Many said they didn’t see the point of paying for an extra service, cheap though it can be. Some said they got rid of it when their children got old enough to have cellphones. “I got rid of mine when I got comfortable with having just a cellphone, but I have been thinking a lot about getting a landline again. 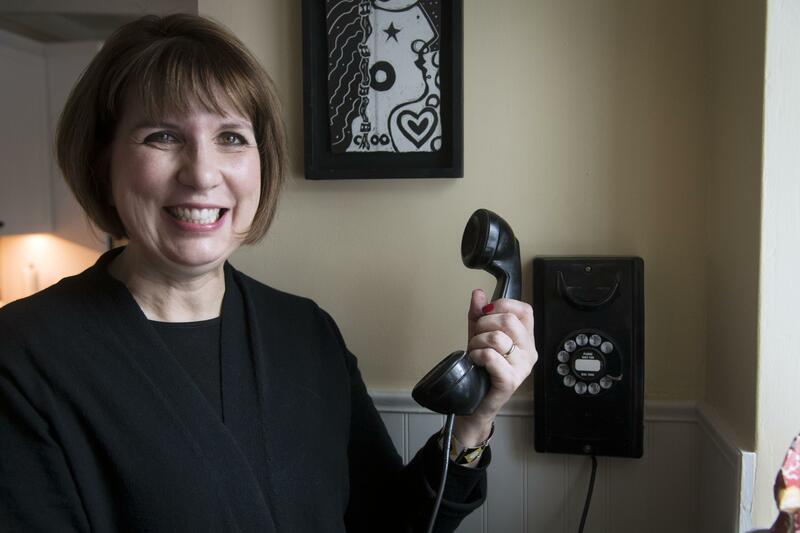 I never missed a call when the house phone rang like I do with my cell,” wrote Vicki Denz, who’s in her early 50s. State regulations have shifted over the past three years to reflect the declining number of people using landlines. The state Utilities and Transportation Commission used to regulate the price phone companies could charge for service, since they usually had a monopoly. In 2014, they stopped price regulations on landlines in most areas because of the competition provided by VOIP, Skype, cellphones and other options. “There wasn’t a need to discipline prices under regulation anymore because the assumption, and I think it still holds, is that the marketplace will discipline their prices,” said Brian Thomas, the director of policy for the commission. The commission does still regulate consumer safety, including 911 availability. The Department of Social and Health Services used to require a landline phone for foster parents, but dropped that requirement around 2013. Now, regulations say only that parents must “have access to a working telephone at all times” while children are at home. Mauk’s house has a functioning rotary phone, along with a more modern device upstairs. She still uses the rotary dial to make calls, though it can be tricky if she has to go through an automated menu after reaching her local pharmacy. Still, she plans to keep it around, along with a manual typewriter, to show her future grandchildren. Plus, “it would leave a big hole in the wall if we took it out,” she said of the phone. Published: Feb. 11, 2017, 5:29 a.m.